There will never be another Cuba as it is today. There was this stint of time in the 50’s when there was money and gambling and rum and cigars. Havana was an incredibly wealthy Caribbean playground that was suddenly shut down, and just left to decay. There is an obvious part of this that is tragic, and has resulted in tremendous suffering. Seventy years later there is an island with Colonial Architecture, classic cars, and more grit and soul and style and beauty than anywhere I’ve ever been. There is so little western influence, you can truly FEEL CUBA. Imagine if you could have gone to Krabi 25 years ago when there were just a few grass huts and a fishing village, or maybe Costa Rica when the beaches were empty and you were the only one in the line up. Picture Cabo with wide open beaches and no hotels. That’s kind of what Havana feels like to me. It is an experience that I feel blessed to have had every time I visit. I am humbled, inspired, and reminded that family, community, and a slower pace results in a much different way of life than we have become accustomed to. It is this pace, and the people that keeps bringing me back. 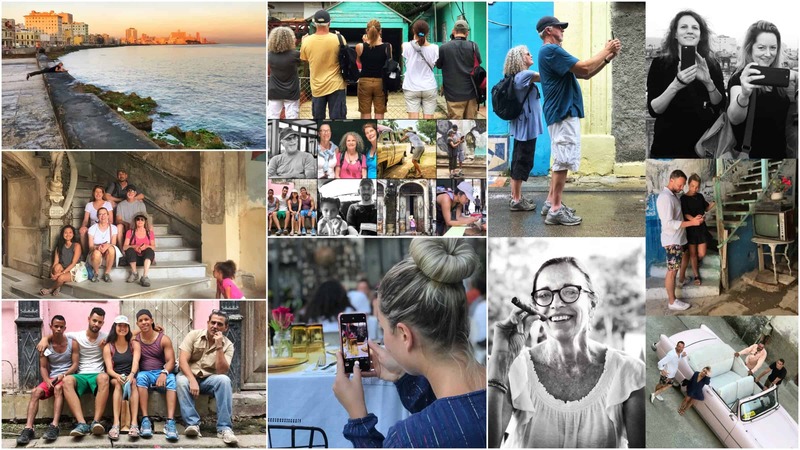 Cuba will always be Cuba, it’s impossible for it to not be; however, the Western culture is making its way into daily life. Every time I return there is a new fancy restaurant, a coffee shop, and more Western amenities. Aspects of this are positive. Tourism is putting more money in the locals’ pockets and I have seen an improvement in the quality of life for many of my friends. As we know, change is inevitable. We cant stop it, and there are aspects of this change that are positive. If Cuba is on your bucket list, if you want to experience the incredible time capsule that is Havana, then it is time to go. Book now, we’ll be going May16th, 2018 ! The most important thing is that we will be traveling in a small group. There will be no more than seven us, thats including me. Second on the list is inspiration. The streets of Havana, the people, the cars, and the architecture will fill every single cell and touch all of your senses. I can shoot from sun up to sun down and never tire of the beauty that is Cuba. When your on a creative adventure and seeking authenticity you just can’t plan everything. I find that the most interesting things happen when I least expect it, and when I just allow my senses to take over. Everyone is going to have different levels of resilience, and different ideas of what a day of shooting looks like. There will be schedules for each day and different meeting points. If there is ever a time when you would rather be doing something different than the group, thats no problem. My goal is to provide the group with an opportunity to experience Cuba in a way that speaks to each individual. I strive for this to feel like a creative adventure with a group of friends. A welcome change to the senses – Viñales. Viñales is an agricultural area about three and half hours from Havana. The tobacco crops, the tropical valley, and the green are a welcome change to the senses after a few days in Havana. For me the biggest goal in going on this road trip is discovery. I like to be able to pull off the side of the road when we see farmers in the fields, if the light is falling across a field and barn then I want to get out and walk around. This is one of my favorite aspects of traveling and an aspect I’m always excited to share. The town of Viñales is lovely. We’ll go for a short hike across the valley floor and eat at my favorite place for lunch. There will be just enough time to walk around town a bit and we’ll head back early enough to catch the light on the drive home. This is by far our longest day, dawn to dusk ! I will have a detailed itinerary for everyday of the trip. This is here to just give you a rough idea. We have 7 days and 6 nights. Each day will be broken down to before breakfast, after breakfast, and dinner. For those that are inspired we will get up for sunrise, the Malecón is beautiful in the morning, the fishermen are usually out and the light hits the city beautifully. Breakfast is usually a late breakfast and more days than not we will be at El Cafe! Great coffee, perfect eggs, the best pancakes, and fresh juices. It makes for a good meeting place if you prefer to have a solo morning. Animas 303 also serves breakfast every morning and is nice as well. After breakfast we will walk back towards the hotel. It doesn’t matter where we go or how we get there it’s impossible to escape the inspiration that the streets and the people of Havana eminate. Some may need a break at this point, others may just want to regroup and head back out. We will have specific locations and neighborhoods that we will visit each day. It’s always a little difficult to manage the evening light and dinner. If we shoot till dark we eat late and if we eat dinner at a normal time we miss magic hour. SO – we’ll mix it up. Our trip to Viñales will be on our forth day. We will be in one van and we will go where the open road takes us. We’ll go on a short hike, have a great lunch, walk around, and drive back when the light is good so that we can stop for pictures. This is a long day ! If the weather has warmed up and the Valley is hot, we may head to the coast. I’ll be arriving Havana a week early and access the weather and report on the beach options. Animas 303. I have stayed there 4 times now and can’t imagine being anywhere else. Animas opened in the Spring of 2017, it’s an old colonial building that has been updated and turned into a small boutique hotel. I chose Animas because of the people, the cleanliness, the modern amenities, and the location. P.S. Modern amenities in Cuba do not include WIFI, television, or phones. ~ Cuba is a 100% developing country. Most importantly this means there are NO ATM machines, and NO ONE excepts U.S. credit cards. There is WIFI at the larger hotels, not in our hotel. It usually works, it’s usually slow, and sometimes fast. $50 USD a day should be more that sufficient to cover your expenses. I have an iPhone 7+ and use AT&T, I had zero cell service. The WIFI is usually fast enough to make calls. As far as I am concerned less is more. The weather will be warm during the day’s and a bit cooler in the evenings. I find jeans to be a little hot. I wear skirts and dresses a lot and prefer to have pockets. Some mornings I’ll put exercise clothes on and the next thing I know I’ve been wearing leggings and a tank top all day. I wear tennis shoes or my Birkenstocks. There will be a few evenings were it’s fun to dress up a little, but truly you can wear just about anything you want no matter where we go. Our days will be long and comfort is the key. We will plan a short hike in Vinales and it can be hot. I like to have something light weight that covers my arms and chest as well as a hat. For our May 2018b trip if the weather has gotten to warm we may head to the cost instead. I love good food! There’s not a lot of variety in Havana but I definitely have my favorite places to go. There are a number of good breakfast spots, and we will have great dinners every night. Dinners are included but not the alcohol. I suggest bringing plenty of snacks. I bring protein shakes, nut butter packs, trail mix, chocolate, bars. Anything that you like. Sometimes we may end up waiting and sometimes the walk across town to get where we’re going is longer than expected. I always cary water and food. Hangry is a foreign country with a group of people is the worst ! Your iPhone 🙂 !!! Actually I don’t care what kind of camera you bring or what version it is. I’m going to know the most about your iPhone but I am here to support what ever creative endeavor you may have. Definitely bring an external charger, and if you have a case with a battery pack thats always a great addition. Make sure you have as little on your phone as possible so there is as much memory as possible. There are Scandisk external drives that allow you to back up your work everyday if you like. The WIFI is available but it’s not quite strong enough to back up your work everyday. If your used to using the cloud that probably won’t be available. I am a big fan of my Moments case and lenses. It’s not required at all, but it can be a fun tool to play with. 95% of the time I don’t use anything other than my iPhone. 6 nights at hotel Animas 303. These are the three apps we will focus on the most. I’ve mentioned this many times but you have to remember to download them before you leave for Cuba. You won’t be able to download any apps once we are there. 645 PRO is a great app for allowing us to adopt a lot of the features you would have if you were shooting with a good old fashion film camera. (SLR) You can control the exposure, the focus and add several different filers, PRO Camera is one of my faves for street photography because you can use the entire screen as the trigger. This is great for street photography. Hipstamatic is an oldie but a goodie and has tons of great filters. 645PRO and ProCamera both allow you to save imagery as a RAW or TIFF file.